Saying something about smelt fishing in Lithuania is probably the same as translating a good poem. Obviously, you can try, but you know very well that your chances of conveying even half of its charm are close to zero. But I’m going to give it a try anyway. First, let’s start with what the European smelt is and what makes it so special. It is basically a small fish from the salmonidae family, an ancient fish that lives in the Baltic Sea, which migrates, in very large schools, to the Curonian Lagoon in the beginning of winter. From there, it moves to the branches and channels of the Nemunas river to spawn in spring, usually mid-March. 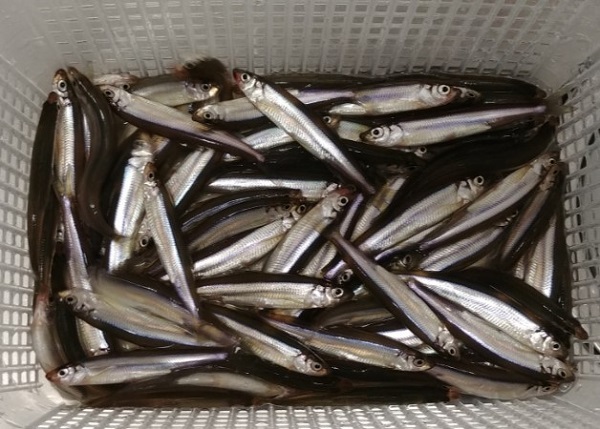 The smelt is about the size of a good finger span, although there are occasionally some large smelt that weigh upward of 100 grams. The most important quality of these small, silver fish is their appetite and massiveness – they move in huge schools, gobbling down everything that they find along the way. And they bite one after another, as long as your fishing rods are positioned on their path. Neither the thickness of the line nor any other tricks usually play a big role in this kind of fishing, so smelt are caught by all – from first timers on the ice to old hands. It’s not much of a secret that another important part of smelt fishing is... cooking. Because not only is this fish unique in that it smells like cucumbers – it also has a unique flavour that even the biggest gourmets can appreciate. There are hundreds of recipes that can be used to prepare these little fish, some going back centuries, and some completely new. But even if you aren’t a kitchen guru, you’ll soon be licking your fingers after simply salting them and frying them in oil. And if you’re too lazy to do it yourself, the nearest café will be happy to treat you to them. An important – or perhaps even the most important – detail in this kind of fishing is the place and time. Smelt are caught through the ice of the Curonian Lagoon – a unique lagoon-type body of water that formed about 5,000 years ago, when a strip of sand brought in by the waves separated the branches of the Nemunas River from the Baltic Sea. That’s why when you fish on the western side of the lagoon, you always see the high sand dunes in front of you, with the sea murmuring behind them. You’re surrounded by the forests belonging to the Curonian Spit National Park and just a few tourist towns, where the lights of the cottages and the blinking beacons of the lighthouses make it possible to figure out which part of the lagoon you’re in. And there’s a reason why I mention the lights – even though smelt are known to bite during the day, the best time for fishing them is still an hour before and a few hours after dusk, and an hour before and an hour after dawn. So most of the fishing takes place on the ice at night. Just imagine – a limited circle of light, a sliver of the moon with a shimmering constellation hanging above you, a fresh breeze coming from the sea, and of course, the blackening holes in the ice with the tops of brightly colored bobbers. Isn’t that romantic? You say sitting on the ice alone at night is scary? No, nothing of the sort. You will definitely not feel lonely on the lagoon. You see, smelt fishing, which has had a cult following among Lithuanians for centuries, brings tens of thousands of fishermen from Lithuania and its neighbouring countries onto the ice on weekends, all of whom spread out over an area of several hundred square kilometres. Entire tent cities sprout up on the ice. Thousands of lights flicker. Grills smoke. Toasts fill the air. As does the occasional song. Carriers bringing fishermen in and out scurry back and forth, working almost without rest. Thousands upon thousands of lights twinkle wherever you look. And this goes on almost the entire time the lagoon is covered with ice that is thick enough and the smelt are biting. And they usually do bite, just not the same everywhere, so you have to go look for them. Oh, and sometimes when you’re fishing for smelt, you’ll hear an odd noise – as if someone was monotonously beating a strange drum. You can even feel the vibration passing through the ice if you’re sitting near one of these invisible “shamans”. This is actually an archaic method of attracting smelt that is used by local fishermen, who are allowed to fish with nets. This is the sound when a board of a specific length and thickness made from a special wood (usually spruce) is dropped into a hole in the ice while a fisherman beats it with specially carved sticks to a uniform rhythm and amplitude while singing the smelt incantation,“stinta puki, stinta puki”. It’s hard to say how it attracts the smelt – there are all kinds of theories – but the fact that it works was noticed long ago. Smelt biting is usually extremely nasty, especially when fishing during their highest level of activity. The spring bobber quivers and bows. And if you don’t jerk in time, the entire rod often jumps from the ice. Smelt always come in schools, so you usually see how the fishermen set up a little farther away begin lifting their arms, and then just look – your spring bobbers are moving too. A few rods are usually used to catch smelt, so often you get bites on all of them at the same time. If a school of smelt stays any longer where you are, then you usually only fish with one rod because there’s no time for the others. There’s no way you would call this kind of fishing relaxation – as long as the school is there, you’re constantly jumping around on the ice, waving your arms, pulling out one fish after another, and setting the rod back down. You don’t even notice that you’re covered in sweat, and after working like that for a while, that your back and all of your muscles hurt... But you don’t feel it at all, because you’re totally absorbed in the excitement. Even after you return to where you’re staying or head back home, your thoughts will long be filled with those quivering spring bobbers, the smelt floundering on the other end of the line, and the romance of the night. Success in smelt fishing is inconsistent. Some may only pull in a few dozen fish in an evening, while others might catch a few hundred. The most common reason for this is that some people manage to find larger schools of smelt or their migration route, while others don’t. Smelt usually migrate to where there is a slope on the bottom – a slight decline or incline in the water’s bottom contour. In order to locate these places more easily, more and more fishermen are using Deeper fish finders for smelt fishing. This device not only helps in monitoring the bottom, but also in finding the actual smelt. Smelt are usually not active during the day time. They’re there, but only one or two will bite. If you find a place where the Deeper fish finder shows a cluster of smelt – that’s the place to set up. The time will come when they become active and start biting, one after another. And if the Deeper fish finder doesn’t show any smelt in that place – don’t waste your time. Modern technology will definitely help you catch more. About tools and technology. Smelt are not demanding fish, and fishing for them doesn’t require any special tools. The simplest ice fishing rod with a spring bobber that you can find in any fishing shop will do just fine. The main fishing line is 0.2–0.5 mm. You won’t need a lot on the reel, since the lagoon is relatively shallow, and the fishing is usually done at a depth of 2–4 metres. A rig is attached at the end of the line, with anywhere from two to five light jigs with large hooks tied on short, 2.5–4 cm leaders. A sinker or a spoon lure is attached to the end of the rig. Lithuanian fishing rules permit the use of up to four fishing rods or up to 12 hooks at the same time. I personally use two rods with three jigs each, and the catch is definitely just as good. Obviously, you can tie the rigs yourself (it’s always more fun to catch on your own), but the most convenient way is to buy them already tied so as not to waste time. Small pieces of fish are used for bait in smelt fishing, and it’s easiest to prepare it when you’re still in a warm room, since your hands are cold on the ice. Local fishermen always appreciate a fresh piece of common roach or carp, but smelt also bite just fine on pieces of their own kind or Baltic herring that you can borrow from fishermen returning from the ice or buy in a shop. When fishing for smelt, it’s very common to get burbot bites as well. These are large, exotic-looking, archaic fish that weigh between one and three kilograms (2-10lbs), or sometimes even four. Burbot hunt smelt at night and often don’t turn down a piece of fish on a spoon lure or a jig either. Getting a bite from that kind of monster on a smelt rod always comes with a lot of problems and a tonne of adrenaline, since it’s extremely difficult to entreat a fish like this into a narrow hole in the ice. But if you win the battle, you feel like a Neanderthal who has killed a mammoth... That’s an extra bonus for the smelt fisher. “The Cold is Not Your Brother”. This is an old Lithuanian proverb, and it is true. When you’re setting out to catch smelt, it’s important to dress warmly, and also not to sweat on your way there, because otherwise you’ll get cold later. This is easier with modern, breathable clothing and layering, so you can add or remove a layer based on the situation. The wind on the lagoon is particularly deceptive, blustering in the large areas. If its speed is under 6–7 m/s (21-24 ft/s), you can fish without cover. But if it’s any stronger, then you have to think about a tent (these can easily be rented) or some other kind of shelter. When there is no snow on the ice, it’s dangerous to walk on because there is always a chance of slipping. In this case, you have to have special clip-on cleats or studded boots. And then, of course, a warm thermos of tea or some stronger, and sufficiently high-calorie food so that your body has the energy it needs to be out in the cold for a long time. 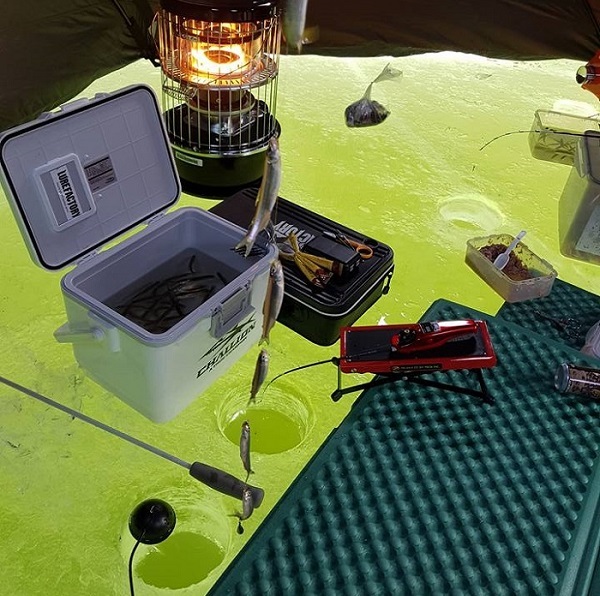 When fishing for smelt at night, you have to put a lamp on the ice, since its light will attract the fish and illuminate your rods. You’ll also need a headlamp and a telephone with an extra external battery – not just to pair with a Deeper fish finder as a monitor, but also to call a carrier if you have to, to bring you back to shore. 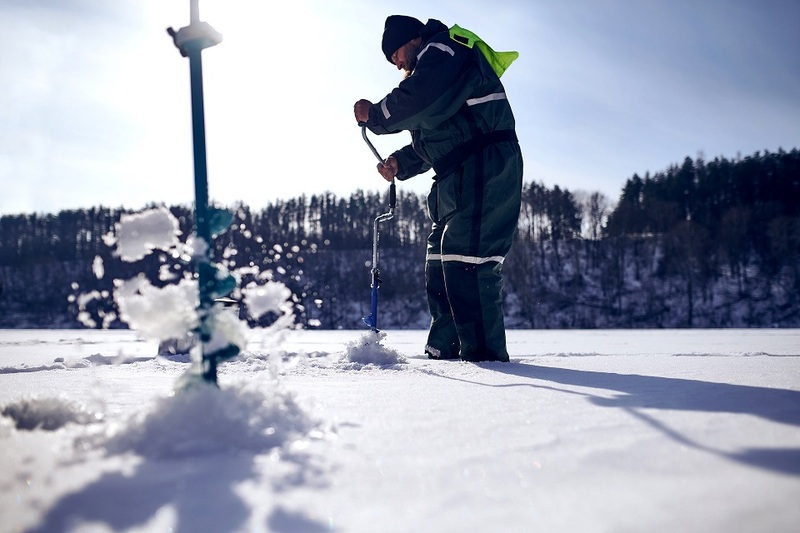 Ice fishing for smelt starts in Lithuania as soon as the ice on the Curonian Lagoon is thick enough. In recent years, this usually happens in mid- or late-January, and lasts until the beginning or middle of March. Before coming, be sure to check out what the ice is like, because these days, you never know what nature is going to hand you. Many fishermen from Lithuania and neighbouring countries can’t imagine winter without at least one outing on the ice of the Curonian Lagoon and smelt fishing. Because it is a unique experience that is difficult to describe with words, but which stays with you for a lifetime. I’ve never met a person who, after catching smelt for the first time in the Curonian Lagoon, didn’t talk about it without enthusiasm. That’s smelt fishing in Lithuania. Once you try it, you can never forget it.